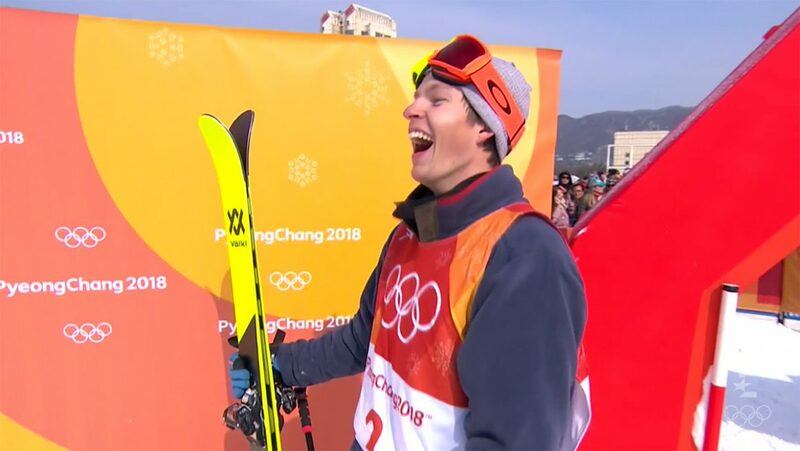 After a qualification round of epic proportions, it was hard to imagine just what would go down in today’s Men’s Olympic Ski Slopestyle Finals at Phoenix Park, South Korea. The qualis had seen crazy lines through the rail sections and massive tricks in the jumps, and that had just been the prelude. What would the finals bring? After a few seasons of build-up and hype, it was time to find out. Jonas Hunziker crashes hard on the first rail. Evan McEachran kicks things off with a very strong run, spinning like a top through the rails with tricks like a 450 on, back swap, 270 out before stomping a triple cork 16 lower down. Score: 89.4. Ferdinand Dahl and Elias Ambühl both crash. James Woods comes tearing down the slope like a man on a mission. He nails the rail section, lands a left triple cork 14, but goes just a bit too massive on a switch triple 14 at the bottom. Gus Kenworthy also can’t seal the deal on the last jump, and Teal Harle misses the switch 360 onto the down-flat-down that he’s been nailing all day. Nick Goepper bobbles a few pretzels, and then Øystein Bråten steps up and delivers exactly what the judges want to see: a technical rail run with front-swap 450s out in both directions, followed by well-grabbed, well-executed jumps: double cork 12 and back-to-back switch double 14s. Øystein pops in the tail-to-tail grab on the last trick as a cherry on top. Score: 95, and the bar has been set high for a first-run score. Alex Beaulieu-Marchand comes off a rail early and scores in the low eighties, Andri Ragettli lands a clean run including a triple 16, but the judges are coming down hard on his rails and he scores an 85.8, good for bronze at the moment. Top qualifier Oscar Wester crashes, and the round is over. Øystein is happy with his score. Jonas can’t quite hold on to a double cork 12 seatbelt, and Evan gets hung up on the first rail and goes down hard. Ferdinand Dahl puts down a run but is scored in the mid 70s with a missed grab. 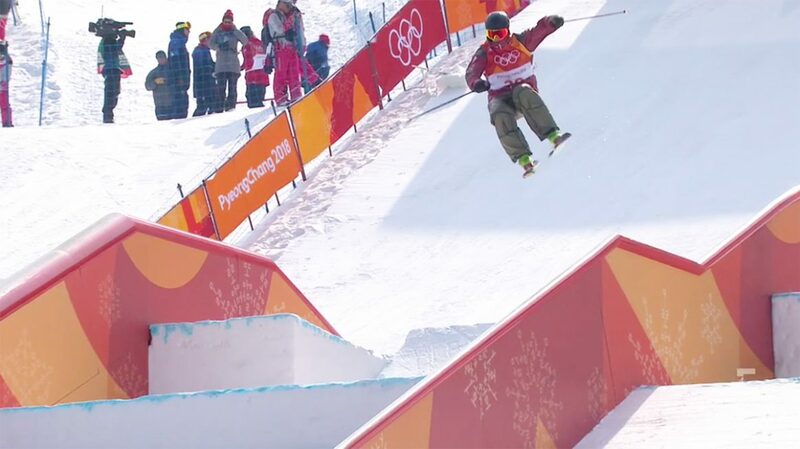 Elias misses his front 450 out of the first rail, and then Woodsy comes tearing down the course again like a bat out of hell, airing over the goalpost in the second rail tier just like snowboard gold medalist Red Girard, before stomping not one, but two huge triple corks—one forward, one switch—in the jumps. Minds have been blown. He’s even got a freakishly tweaked 360 mute on the setup jump to provide some classic Olympic flavor. But his rails weren’t quite flawless. Score comes in: 91. Damn. Gus falls. Teal puts down a gold-medal run in the rails with a huge 450 disaster that no one else is doing, but has speed issues in the jumps and crashes. Goepper is off, Oystein messes up a rail, and then ABM finds his time to shine, nailing his run just about perfect: big disaster spins in the rails, a beauty of a rightside double 900 reverse mute, and a switch triple 12. He rolls into second place with a 92.4. Andri goes for the nose-butter triple but doesn’t have the amplitude and barely squeaks it out. Oscar again has trouble in the rails, and just like that, there’s only one run left. Woodsy goes all out with two triples. Tweaked mute grab, throwback to the legends of the sport! It’s still anyone’s ballgame. Jonas puts down a clean run until he loses a ski on the last jump. Evan messes up his first trick, then tries to slide the whole C-rail around the bowl just for fun. Ferdinand also has problems on the first rail, as does Elias, who nevertheless stomps his ski-kickflip dismount at the bottom for the crowd. Then it’s Woods again one more time. The beast. The man. The beast of a man. What more can he possibly do? He already did two triples. Now he has to step it up even more. What will he do? He misses his blind 450 in the rails and solves that problem prematurely, but he still skis out the rest of his run and stomps his jumps even better than before. He’s still in bronze medal position. The jumps look like they’ve slowed down. Gus looks off in his run and won’t advance. Teal lands a massive run, adding a backslide 270 out of his huge 450 disaster, but is scored underneath Woodsy. 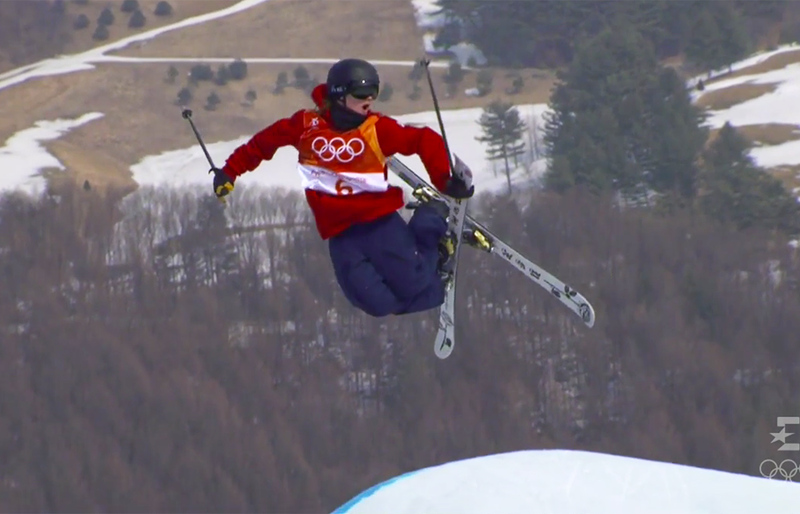 Then Nick Goepper steps up with a clutch final-run performance: pretzel spins in the rails, two dubs and a trip in the jumps, adding some mute to double-japan grab flavor in the triple 14. 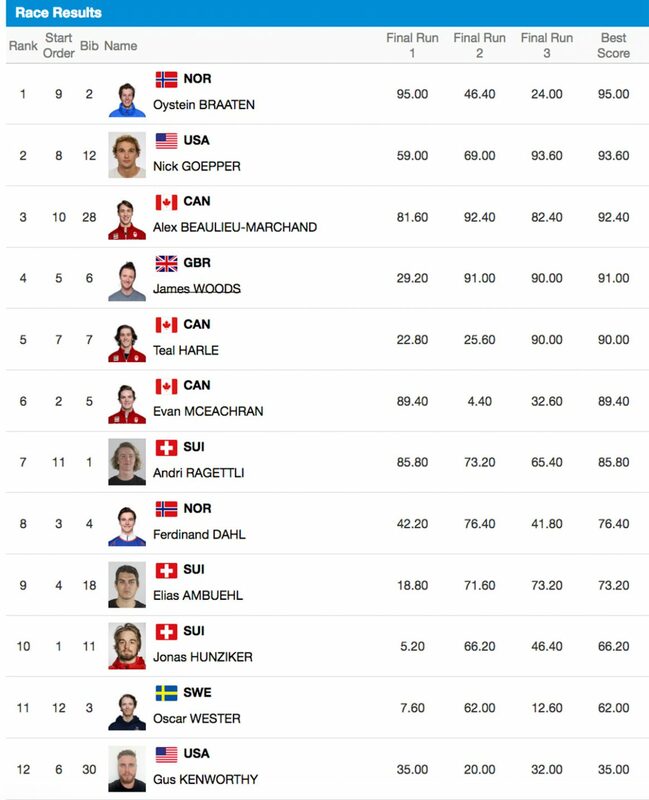 Goepper scores a 93.6 and moves into second place. ABM’s in third, and Woodsy has been bumped off the podium. Noooo! How many times has this man placed in fourth? Far too many, that’s for sure. ABM drops in for his last run but doesn’t improve his score. Andri can’t land the jumps he wants; he’s super bummed. And Oscar Wester—remember him, the guy who qualified first? drops in for the last run of the day. He crashes on his air into the quarterpipe, and it’s a done deal: Øystein first, Goepper second, ABM third. And there you have it, folks. ABM lines up a big switch 270 disaster. 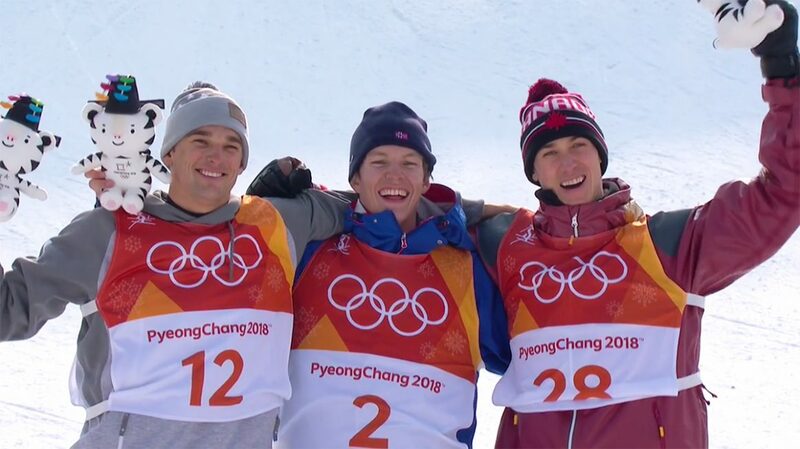 Your men's ski slopestyle medalists. "Race results"? C'mon, Olympics, seriously?